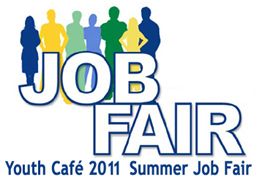 The Service Canada Centre for Youth (SCCY) in Montréal, Youth Café is holding the 2011 Summer Job Fair. This represents a fantastic opportunity for young people to learn about the employment seeking process or to continue the steps they already initiated. The 2011 Summer Job Fair is absolutely free and will allow participants to meet local employers and apply to the positions that interest them. We encourage young job seekers to have their resumes on hand to establish a first contact with the employers who are present. Open to the general public, admission is free.